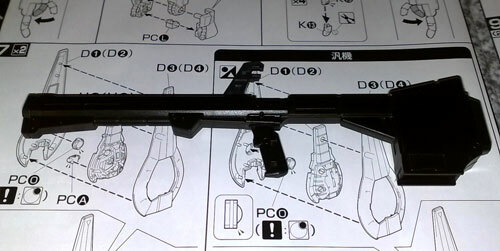 Started building already the 1/100 Rick Dias from Bandai that arrived for me recently. I was able to jump right in the contruction phase because the translation of the Rick Dias manual to English took a lot quicker than I had expected since there weren't a lot of stuff to translate with regards to building instructions. I had already finished with the 1/72 VF-25G Messiah from Bandai that I was initially building, all that was left to do was decal it. 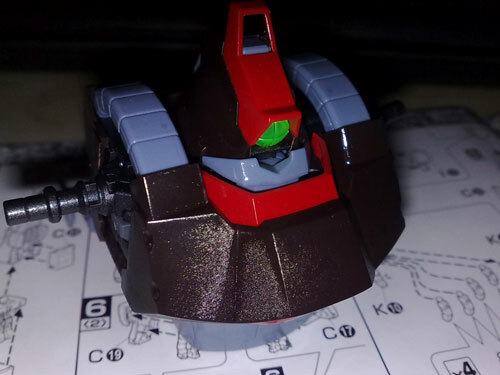 I have to confess though that I was overwhelmed by the amount of decals that had to be put on, so I decided to forego it in the meantime and do instead something less stressful, which was to build the Rick Dias. I will decal it though, when I have the proper mindset already for that more difficult task. 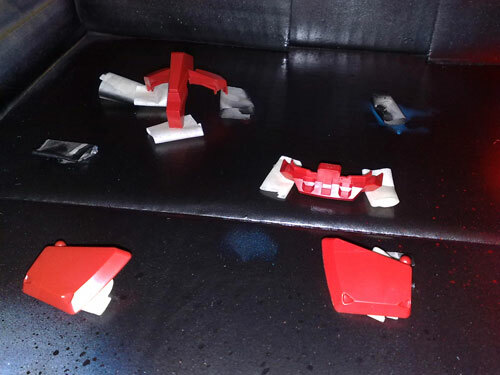 For colors I had on hand Pylox Fire Red, Flat Black and Metallic Graphite. Since I am without airbrush, I got the closest color instead to what was referred to in the Rick Dias' Color Guide. Those colors that I don't have and were not available (e.g. Brown and Light Grey), I decided to just hand paint over with Acrylic based Future floor wax. This time there was no top coat of Future and cleaning of the parts with soapy water, I just dived right down to the building. 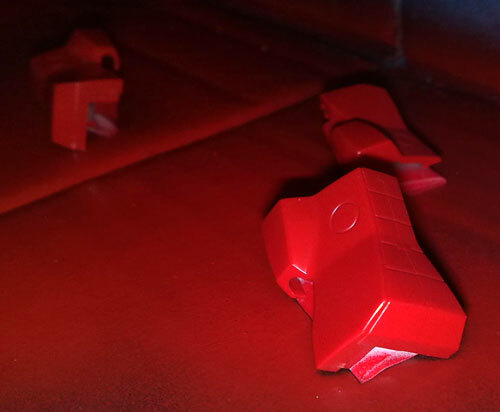 Also I used the spray head from a GSI Creos Gundam Spray in place of the original spray head that came with the Pylox Spray in order to have a good and thin mist pattern that doesn't come out thick. Here is a shot of the assembled torso. I experimented with using clear coat from Pylox to coat the areas without paint and I have to say that it came out not what I was expecting. 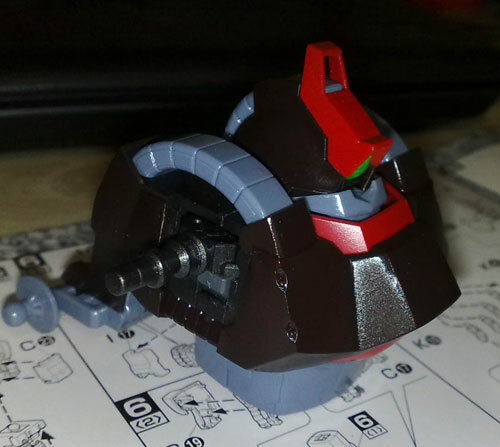 If you notice, the brown chest armor comes out rough and patchy with a coat of clear. Compare that to the head, which was just coated with Future, its much smoother. Then again, I guess its up to your preference on what type of surface you want. I'm thinking that its not a total loss because if in case I want a rough surface, I can just coat it with the clear coat. The Rick Dias Quattro Bajeena variant gives you the option to build it as a Quattro version or as a Generic version with the interchanging of some parts, this build I decided to go with the Quattro version. Here's a shot of the main hip without its armor. 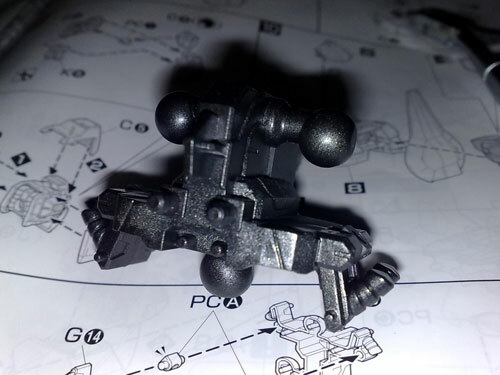 I decided to paint the internal parts Metallic Graphite. The metallic line series of paint by Pylox is about $1 more expensive than the regular paints, but its worth it because it does look nice. This too was painted without any Future painted on top of it as a primer. The paint does seem to be a bit thicker than the regular paint from Pylox. Because of which I had to file down the paint that had accumulated on the posts so that it can connect with its opposite hole. Here's a shot of the assembled and painted Clay Bazooka of the Rick Dias. This was painted with Pylox Flat Black and without any Future Floorwax as a primer. There are some paint splatters, not unlike the original GSI Creos Gundam paints, due to uneven spray flow but its not quite noticeable from afar. Here's a current shot of the 5 minute spray booth that I built a while back. It's been quite useful. And judging from the amount and variety of paint on it, if it could talk it would probably have a lot of stories to tell with regards to mis-paints due to the stupidity and the curse words that ensued. Good thing the spray paints are forgiving, so all I had to do was sand paper off the paint and start again. I'm thinking of building another spray booth because I can get things done quicker with another spray area, materials is not a problem when it comes to this spray booth because I have some more scrap box materials to make a spray booth with that came with the Rick Dias. Will post again soon with more updates on this build.